When it comes right down to it, isn’t this what war is all about? 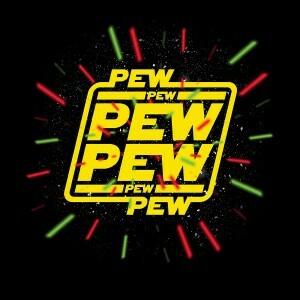 The pew-pew-pew-pew-pew? That sounds like it should be a song. Someone get me the Max Rebo band on the line, I have a new song for them. In the meantime, they and you should invest in this torso wrapping. With the red and green lasers all over it, it makes for a passable holiday shirt. And, really, with the new Star Wars coming out in December, isn’t Star Wars a holiday worth celebrating anyway? This AT-AT Is No More!